For a while I made it a point to buy one of every figure with a Glyaxia symbol, like good old Standard Ecroyex Glyan here. And then we had drops that would cost a couple of hundred bucks to assemble, at which point I thought "Well, that was fun." There are still plenty of great figures with awesome design flourishes, and the little quasi-Atari faction symbol on his shoulder really is quite cool. While nobody probably needs every last flavor of this one, I will say I'm glad I bought it - even if I sat on it for about a year before opening him. I missed the first drop for the yellow one, so I was happy to see that the swell Red Army T-011 Bunkerbuster Tank didn't sell out immediately. I'm sure the price had something to do with it - $30 is on the high end of these smaller vinyl items, even if it has a lot of paint, stickers, and options. It's also the first toy I've bought in ages that actually was designed to make good use of all those extra Glyos heads you've been storing in boxes for the last few years. It's quite versatile and as it can fit most Glyos figures, heads, or even 3 3/4-inch action figures, it's easily the best Glyos-compatible vehicle to date. 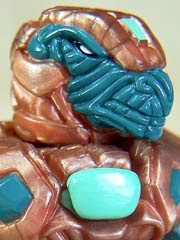 If you're a toy collector and you also like Glyos, this (or a subsequent recolor) is an essential purchase. The Mystical Warriors of the Ring have been around as specially-cast figures and as non-articulated figures in the proud tradition of M.U.S.C.L.E. and O.M.F.G.. This Green Goliath is the line's first take on a Glyos-compatible figure, even though the big guy remains in scale with the rest of the non-articulated slug figures. He's made up of 9 pieces and swaps out very nicely with Armorvors and Kabuto Mushi figures - I assume customizers are going to have a blast with this one. Cast in grey plastic, the Slate Zone Power Soldier is - as are his siblings - a wonderfully engineered figure. The Glyos system was adapted to a so-called "Glybrid" joint system in which we got the functionality of Glyos and Hasbro's ball joints in a 3 3/4-inch humanoid figure. So no matter what, this is a good figure with a great range of motion. When placed in context of its line, it becomes a bit of a bore being one of only two body types during the line's first year and a half, give or take. Endless repaints are a bitter pill to swallow, with other Glyos-compatible lines usually cranking out an all-new figure ever year or so with more customization options. It seems almost unfair to judge this figure for things outside its control, because the plastic person presently performs pretty admirably.